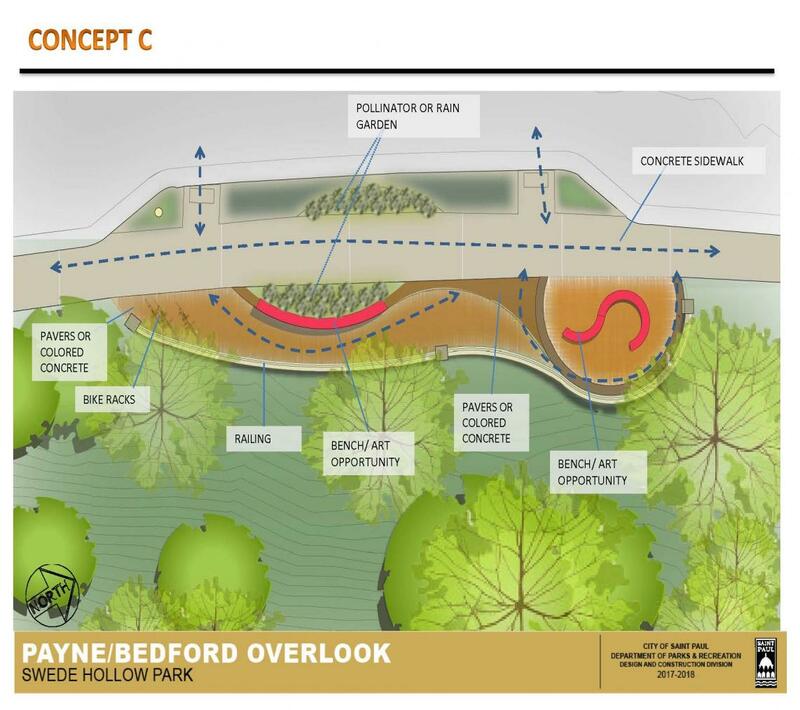 The project entails the design and construction of a small overlook/plaza near the intersection of Bedford and Payne Avenue that allows a visual relationship with Swede Hollow Park. It also provides a small gathering space with sitting and resting features for pedestrians and bikers. The overlook/plaza will enhance the intersection crossing as a focal point where people can visit while shopping and dining in nearby local businesses. The project will explore opportunities for creative place-making and art installations. 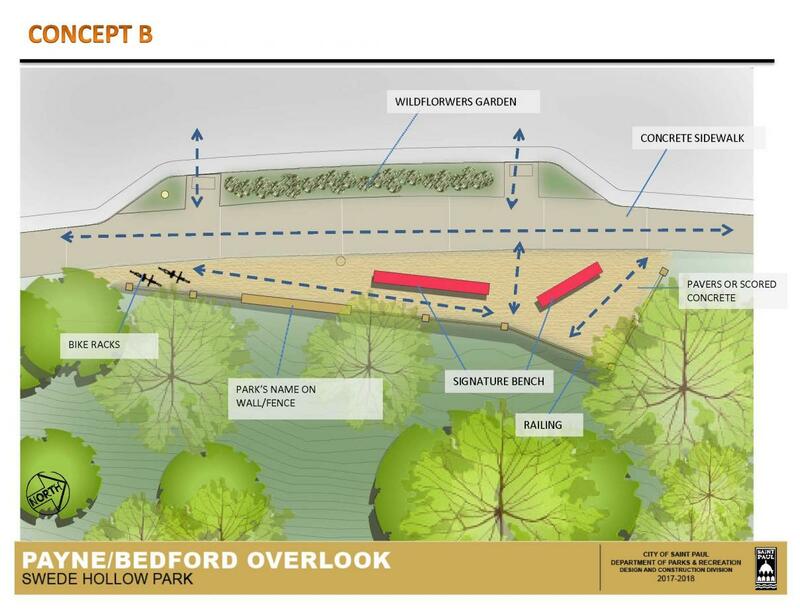 The addition of the overlook to Swede Hollow Park near the Payne-Bedford intersection was recommended in a report prepared by the Saint Paul Design Center in June 2014 and coordinated with the Railroad Island Task Force and a convened team of stakeholders for two days of workshops. The report identifies improvement projects along the Payne Avenue Commercial Corridor. The implementation projects are funded by the Commercial Vitality Zone program. The realignment of the intersection at Payne Ave and Bedford Street was culminated in 2016. The intersection has become safer for pedestrians and offers a better environment for residents walking and coming to the business area. We will not be able to start construction of the Payne Bedford overlook until Spring 2018. Although we remained optimistic that we could complete the project this fall, temperatures have been consistently lower than average causing the contractor to postpone construction. The project is and will remain a priority for this next spring. The contract is nearing the end of the signature routing stage and should be wrapped up very shortly. Once the contractor has the contract, we'll work with them to begin their work as soon as possible. Concept A : The overlook space is organized symmetrically to the Bedford street alignment, opening a gathering space in the center, taking advantage of the curb extension to create a buffer garden and incorporating the sidewalk for extra space. The design elements and style is traditional to the overlooks we have in Saint Paul. Concept B : This concept organizes the gathering space on the side of the area that feels more comfortable to seat and direct the pedestrians to encounter views to the park. The sitting elements are signature benches and contrast the straight-lined movement of the design. Concept C: This concept organizes the space same as Concept B but adds some organic movement that follows the bluff’s edge. The pedestrian will encounter a transitional space with seating and a gathering space to overlook the park. March 23, 2017 - Railroad Island Task Force Meeting. 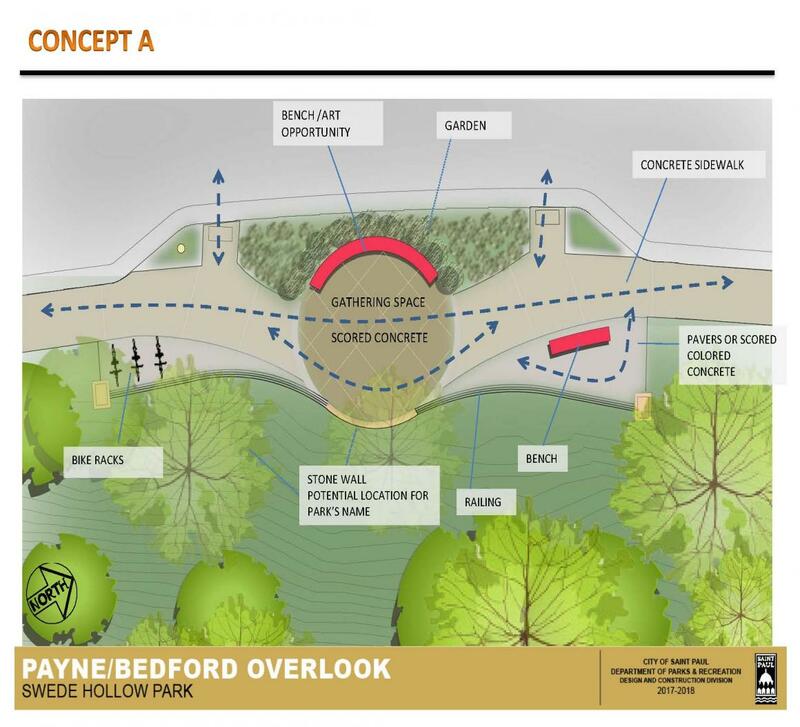 Parks and Recreation provided an update of the Payne/Bedford overlook project.